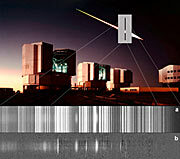 ESO's Very Large Telescope Obtains Unique Spectrum of a Meteor. While observing a supernova in a distant galaxy with the FORS instrument on ESO's Very Large Telescope at the Paranal Observatory (Chile), astronomers were incredibly lucky to obtain serendipitously a high quality spectrum of a very large meteor in the terrestrial atmosphere. The VLT spectrograph provided a well calibrated spectrum, making it a reference in this field of research. From this spectrum, the temperature of the meteor trail was estimated to be about 4600 degrees centigrade. The serendipitous spectrum reveals the telltale meteor emissions of oxygen and nitrogen atoms and nitrogen molecules. The VLT spectrum was the first to reveal the far red range where carbon emission lines are predicted; the absence of the lines puts constraints on the role of atmospheric chemistry when life started on earth. Because the VLT is tuned to observe objects far out in space, it focuses at infinity. The meteor, being "only" 100 km above the telescope, therefore appears out of focus in the field of view. A popular saying states that when you see a meteor, you may make a wish. While astronomers cannot promise that it will be realised, a team of astronomers  have indeed seen a dream come true! 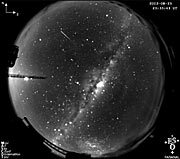 On May 12, 2002, they were lucky to record the spectrum of a bright meteor when it happened - by sheer chance and against all reasonable odds - to cross the narrow slit of the FORS1 instrument on the ESO Very Large Telescope. At the time of this unlikely event, the telescope was performing a series of 20-minute spectroscopic exposures of a supernova in a distant galaxy in order to establish constraints on the dark energy content of the Universe. Thanks to its enormous light-collecting and magnifying power, the VLT recorded the spectrum of the meteor trail perpendicular to its path on one of these exposures. "We really hit the jackpot", says ESO astronomer Emmanuel Jehin: "Chances of capturing a meteor in the narrow slit of the FORS1 spectrograph are about as big as for me winning the national lottery." Meteor spectra have on occasion been obtained serendipitously during photographic star spectra surveys. But this is now maybe the only meteor spectrum recorded with a large telescope and a modern spectrograph. The spectrum covers the wavelength range from 637 to 1050 nm, which is dominated by emissions from air atoms and molecules in the meteor path and teach us about the collision processes in the wake of a meteoroid. The rapid motion of the meteor across the sky resulted in a very brief exposure while crossing the narrow spectrograph slit - only 1/50 of a millisecond! - and despite the relative brightness of the meteor it was only thanks to the VLT's great light-gathering power that any record was procured. The meteor was estimated at magnitude -8, or nearly as bright as the first-quarter Moon. Although it is not possible to be sure from which shower this meteor belongs, a possible candidate is the Southern May Ophiuchid shower which appears from a direction just east of the bright star Antares. The shower contributes only one or two meteors per hour but was one of the stronger showers of that night. "At first, the bright trace across the supernova spectrum was a puzzle, but then I realized that the spectroscopic signature was that of our atmosphere being bombarded," says astronomer Remi Cabanac of the Catholic University of Santiago de Chile. "We asked around to see if others in our country had witnessed the meteor, but it seems we at the VLT were the only ones, perhaps not too surprising as Paranal is located in the middle of the empty desert." And unfortunately for the astronomers, the MASCOT all-sky camera (e.g. ESO Press Photo eso0424) was not yet in operation at that time. The VLT spectrograph provided a well calibrated spectrum of the meteor emission, making it a reference in this field of research. The meteor emission results from collisions between air molecules, knocked to high speeds after initial collision with the meteoroid. Closer inspection of the spectrum revealed about 20 telltale meteor emissions of oxygen and nitrogen atoms and nitrogen molecules (see eso0424c). The ratio of atomic and molecular emissions could be used as a "thermometer" to measure the conditions in the meteor-induced hot gas in the wake of the meteoroid, by means of laboratory measurements and meteor models that calibrate the VLT data. "To our surprise, we found the meteor trail to be wider than expected and also that the meteor's heat appeared evenly distributed in the trail, with the temperature varying only from about 4,570 to 4,650 degrees across the trail," says meteor specialist, astronomer Peter Jenniskens of the SETI Intitute, who analysed the data together with Christophe Laux of the Ecole Centrale Paris (France) and Iain Boyd of the University of Michigan at Ann Arbor (USA). "We later realised that this was due to the fact that, as seen by the VLT, the meteor trail was out of focus, even though it was 100 kilometres away!" The VLT is indeed focussed at infinity, which is perfect for most astronomical objects that it routinely observes. But not for meteoroids entering the atmosphere above Paranal. A point at 100 kilometres distance will appear as a small circle of diameter 15 arcsec at the VLT focal plane. This corresponds to roughly half of the maximum apparent diameter of Mars in the evening sky! It is the same effect as when you try to photograph your children with a forest in the background. If you focus your camera on the distant forest, then (in most cases) your children will be out of focus. Or to put this in another way, the VLT is clearly not very suited to observe ships passing by on the Pacific Ocean, just 12 km from Paranal! The meteor spectrum also provided a first view of such an object in the near-infrared window between wavelengths 900 and 1050 nm. This spectral region contains relatively strong lines of atomic carbon, but no such emissions were detected. "We calculated that these lines should have been visible if all atmospheric carbon dioxide in the meteor path was dissociated into carbon and oxygen atoms," says Jenniskens, "but they were conspicuously absent". This observation is important because it sets new constraints on the efficiency of meteor-induced atmospheric chemistry at the time when life began on our planet. The team is composed of Peter Jenniskens (SETI Institute, USA), Emmanuël Jehin (ESO), Remi Cabanac (Pontificia Universidad Catolica de Chile), Christophe Laux (Ecole Centrale de Paris, France), and Iain Boyd (University of Michigan, USA). The maximum of the Perseids is expected on August 12 after sunset and should be easily seen. The research presented in this paper is published in the journal Meteoritics and Planetary Science, Vol. 39, Nr. 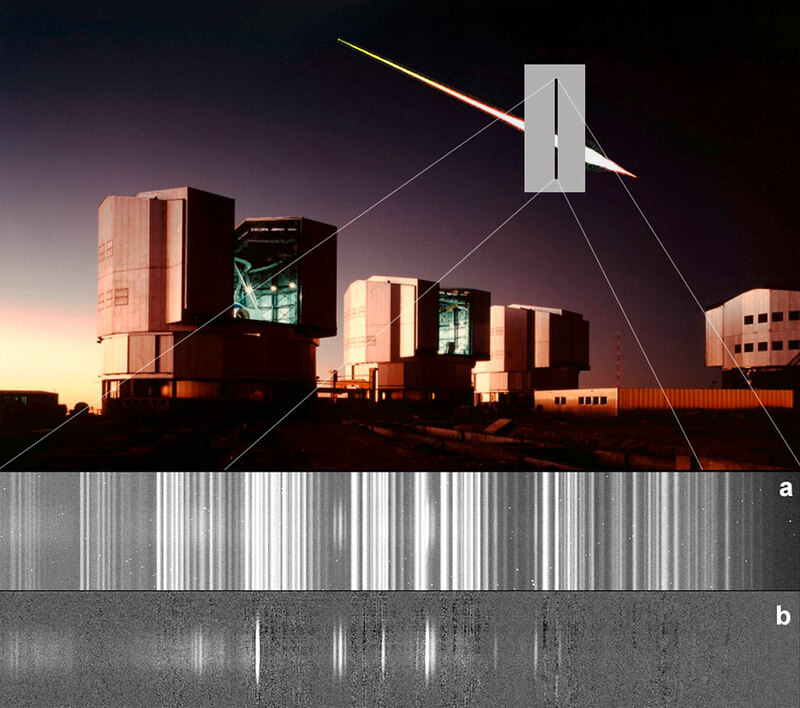 4, p. 1, 2004 ("Spectroscopic anatomy of a meteor trail cross section with the ESO Very Large Telescope", by P. Jenniskens et al.). Meteoroids are small grains of rocks orbiting the Sun. Far smaller than asteroids, they make their presence known to us in a dramatic and beautiful way when they enter earth's atmosphere and burn up, producing a short glowing trail in the night sky, rarely lasting more than a second or two - a meteor. Most meteoroids are completely destroyed at altitudes between 80 and 110 km, but some of the bigger ones make it to the ground. Here they may be collected as meteorites. Many meteoroids originate as fragments of asteroids and appear to be unaltered since the formation of the Solar System, some 4500 million years ago. Based on the peculiar composition of some meteorites, we know that a small fraction of meteoroids originate from the Moon, Mars or the large asteroid Vesta. They obviously result from major impacts on these bodies which blasted rock fragments into space. These fragments then orbit the Sun and may eventually collide with the Earth. Comets are another important source of meteoroids and perhaps the most spectacular. After many visits near the Sun, a comet "dirty-snowball" nucleus of ice and dust decays and fragments, leaving a trail of meteoroids along its orbit. Some "meteoroid streams" cross the earth's orbit and when our planet passes through them, some of these particles will enter the atmosphere. The outcome is a meteor shower - the most famous being the "Perseids" in the month of August  and the "Leonids" in November. Thus, although meteors are referred to as "shooting" or "falling stars" in many languages, they are of a very different nature.